In July 2018, our education team organized a conference named Flip Your Flop to serve teachers in Lao Cai and Ha Noi. During the last days of the conference, our team members and the participants of the conference raised enough money to purchase rain boots for 202 students in San Sa Ho school, Sa Pa. This week, shortly after the school year started, the rain boots arrived and were handed to each student. These boots will keep the students dry and warm in the coming winter. Our team of teachers not only transformed the fellow teachers they were engaging with, they inspired them to transform someone else’s life. San Sa Ho making headlines. In this meeting between school principals and government officials, the noted highlight in education in San Sa Ho was the increased enrollment rate and attendance rate in the three levels of schools. This result is due much to the teachers' hard work and dedication for their students. In the past years, we have been able With our team engagements and projects, we are privileged to contribute to their result. Enrollment rate: 100% of 5 year old into Kindergarten, 100% 6 year old into 1st grade, 97% students into middle school, 45% students graduates from middle school and go into high school and trade schools. HANOI, June 2018 - Austin Mitchell first came to Vietnam on a summer camp trip with GVI. Since the first trip, he has developed a passion for children in Vietnam. After graduating from high school this summer, Austin has decided to intern with GVI Vietnam for a month, leading up to this year's summer camp with Birla. Follow Austin's story below and see how a high school graduate can impact lives in Hanoi. I’m sitting here at Helio Cafe, right down the street from the school where I’ve been teaching for the past couple of weeks. Having commandeered a corner table here for myself, I use it to eat and read after my classes on weekdays. And the classes, which include anywhere from fifteen to thirty sixth-grade students, are reason enough for some quiet time! 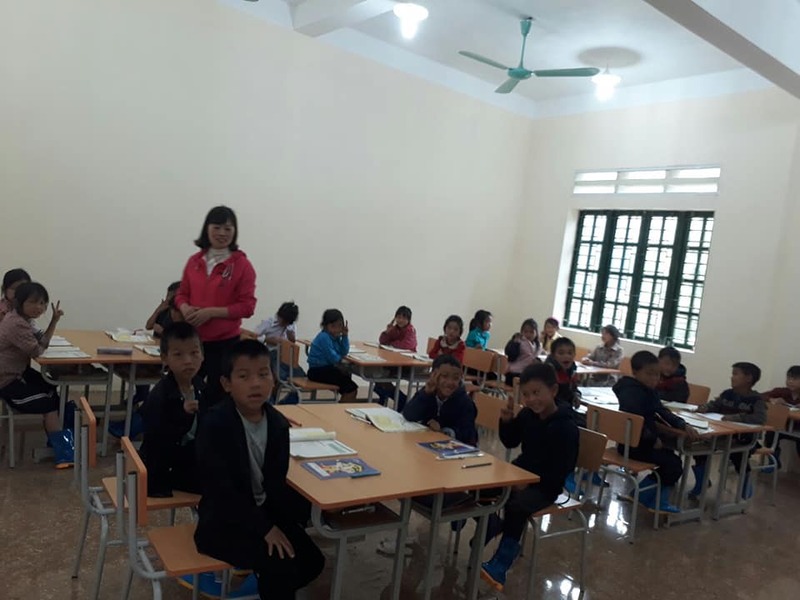 In all sincerity, though, as a GVI intern it’s been incredibly exciting to have the opportunity to fill a volunteer post teaching English at Dịch Vọng Middle School, where I’ve gotten to know about eighty students who are just starting their perilous stint in middle school. 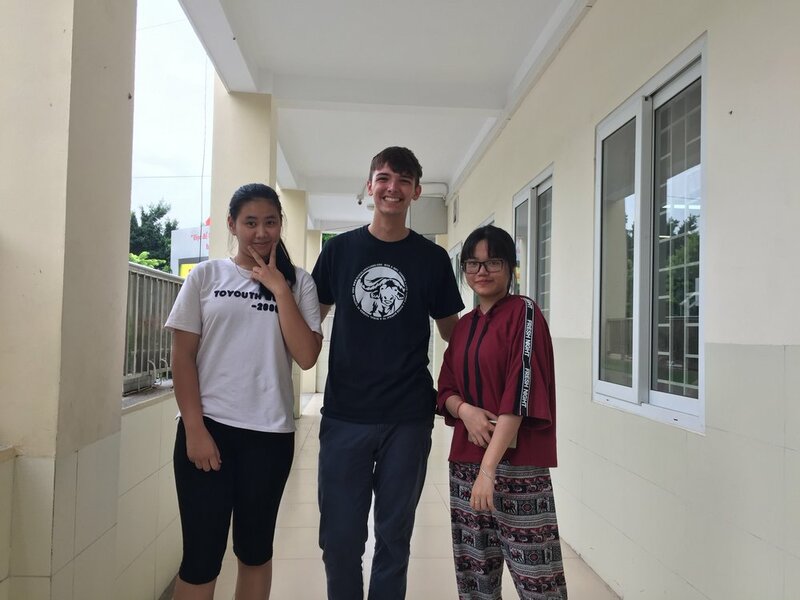 As Hanoi becomes more and more of a global city, English language programs are very much sought-after by school administrators, and so I’m glad to be able to model ELL skills with my students, with the help of some awesome high school freshmen. Linh and Hương, the high school volunteers who’ve helped me with the classes. Our lessons, which will conclude the day after I write this post, have taken place in the form of practice conversations and group activities. We’ve written comics, compared Vietnamese and American holidays, and acted out charades. All of our activities are based in small groups, which I understand the students will remain a part of throughout the school year. The kids’ eagerness to participate, and their surprisingly broad English knowledge (some of these 12-year-olds are fluent!) have made a big impression on me. Seriously, I’ve know high school seniors who can’t engage in a foreign language like these middle-schoolers can. I’ve also come to appreciate the superhuman levels of patience my teachers have exercised for the past twelve years. Very quickly I’ve learned why my teachers did that thing where they stood in menacing silence and dared us to keep talking over them, and also that thing where they always managed to assign me to a different group than my best friends. I guess the realization—that teachers are as courageous as shark tank cleaners, and probably less appreciated—comes a few weeks too late. 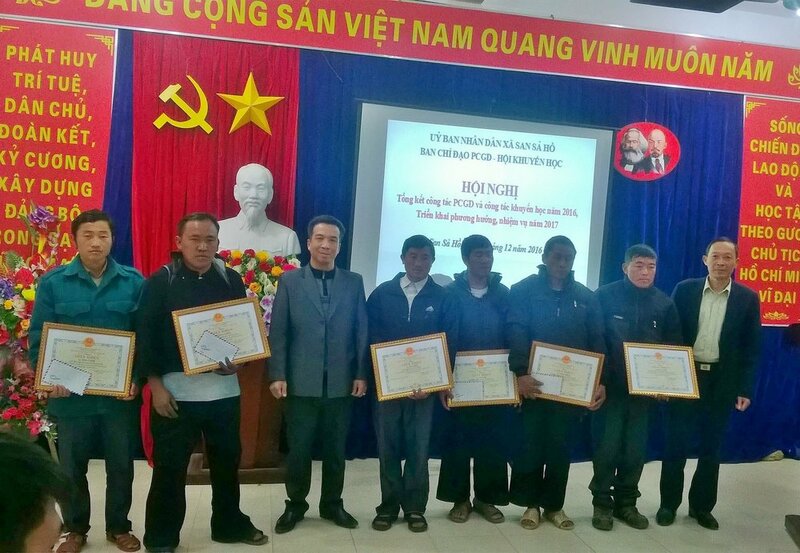 (I picked up my diploma from school two days before flying to Hanoi.) While I’m not even an adult yet, I’ve been consistently mistaken this month to be in my mid-twenties. I guess this is due partly to my ultramature, wise-beyond-my-years personality, and also due partly to the fact that I’m 10 inches taller than the average Vietnamese adult. Students from class 6I write words to accompany the blank comics on the worksheet. Here, students gleefully made their classmates contort after we reviewed English words for the parts of the body. Class 6B at 7:59, right before the lesson started. It’s honestly kind of poetic that my first attempt at adulting should take place on the other side of the globe from Texas, in a city where I’ve stumbled from one daily life task to another. When going out for lunch on my own, choosing a restaurant is a roll of dice, especially when nobody can seem to understand my American accent. The word “broken” isn’t strong enough to characterize my command of the Vietnamese language, but it’s almost appropriate for characterizing the motorbike I nearly knocked over this morning as I dismounted it in front of the middle school, in full view of students and staff. Speaking of which, as an almost 200-pound human it’s amazing how much power I have over traffic patterns from the back of a motorbike. I’m like a rudder; if I lean right even slightly, that entire side of the street has to slow down, which gives me the immense privilege of being audience to a beautiful sixty-part ensemble of bike and bus horns. This tasteful selfie shows my altitude compared to everyone else on the road, including the driver, whose head, as you can see, only goes up to my chin. 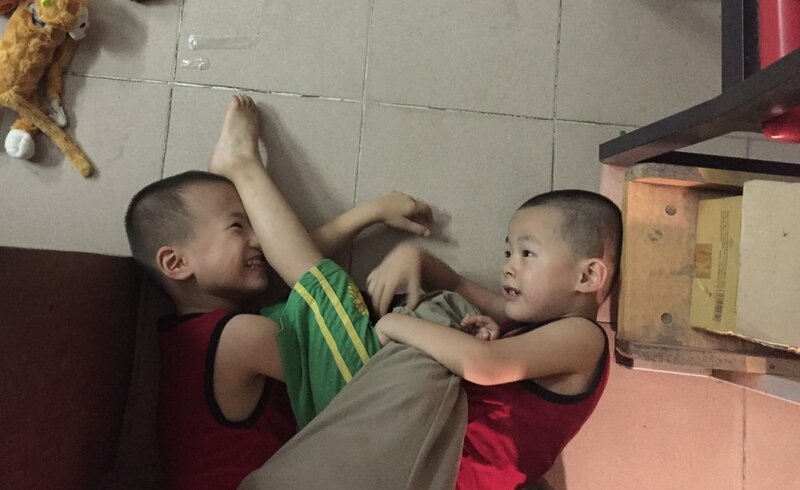 Tan and his family have graciously bent over backwards to help me feel comfortable as part of the household, part of GVI, and part of their neighborhood community. That means being together for meals and chores, morning exercise at the neighborhood lake, and a road trip this weekend with the whole family! And being part of GVI meant help getting to a doctor when jet lag combined with mysterious allergies and cold symptoms to form an infection trifecta for a few days. But as soon as I was feeling healthy, I started classes and visits to Birla Children’s Village, where I’ve been involved for seven years now. 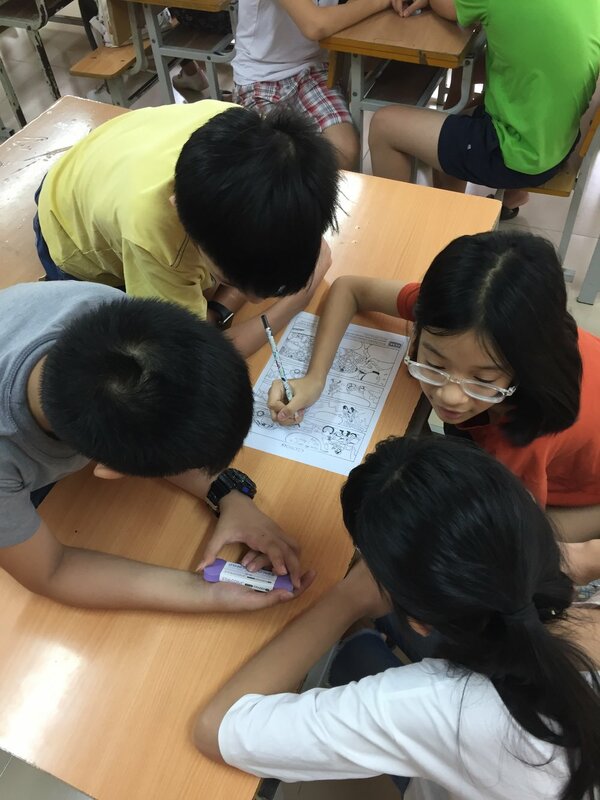 Most of the Children (the main demographic in the Children’s Village) are gone for the summer holiday, leaving behind about ten elementary kids and a dozen or so seniors, who’re busy studying for college entrance exams. So I’ve been operating in unofficial capacity as Minister of Playtime from 3 to 5. It’s during this time that I’ve really actualized my potential to alternate between human jungle gym and human safety net under the metal jungle gym used by the primary schoolers to perform death-defying feats. I’ve also learned new techniques for enticing children to help with chores, and have noticed a knack for making up games on the spot that won’t leave anyone crying. And I've figured out that while “anh bé” means “baby boy,” “anh bế” means “carry me.” So when the youngest resident at Birla, a three-year-old, shouts it at me I shouldn’t just nod and give him a thumbs-up. For the kids at Birla who don’t go home to their families during the summer, I’m told it feels sometimes like they’re languishing, just waiting for everyone else to get back and for structured life to resume. So, like, they’d prefer to be in class to just sitting around in the humidity. So this aspect of my internship with GVI gives me an opportunity to use my skill set (being extremely charming, among other things) to get them up and moving at a set time every day. The childcare domain is as important as education, I think; in both ways, there’s a channel for showing love while also practically enriching the lives of kids, be that with social skills, exercise, or educational content. Being mission-minded, to me, means taking those skill sets, weaving them together, and meeting needs. Game night at Birla Children’s Village. I’m not sure why, but my legs are these kids’ vehicle of choice. Here I’m popping a squat next to two elementary kids in their second day at Birla, alongside their older house-brothers. 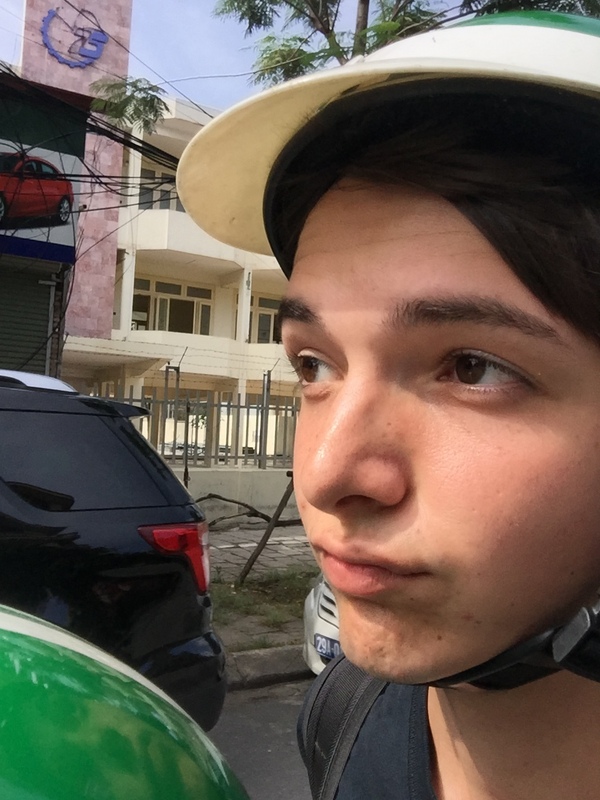 HANOI, June 2018 - In 2015, Weston Dove traveled to Vietnam for the first time on a trip with his school to engage with children living at SS3. He first met Huy on this trip and they became friends. Over the last three years, their friendship has allowed Huy and Weston to have significant impact on each other's life. Check out the video below to see their story and catch a glimpse of our Summer Camp for children living in orphanages. Hang Seo De, a farmer in Bac Ha, Lao Cai, Vietnam received a water buffalo from GVI water buffalo program in 2012. This buffalo has helped his family on the farm and ensured De's children can go through school. In my class, there is boy named Hieu. He has is 2 year old, has a small and bony posture. The first days were painful; he was stubborn and every time he didn’t get what he wanted, he would get angry, lay down on the floor and start crying. Every time we had guests, Hieu retreats to a corner by himself. He didn’t want to interact with strangers. I was perplexed when he behave in this way. “What can I do to better help these kids? What will happen tomorrow?” I asked myself. I tried different methods with stern rules, with punishments, with tenderness, with love. At the end, I chose love to help these children change. 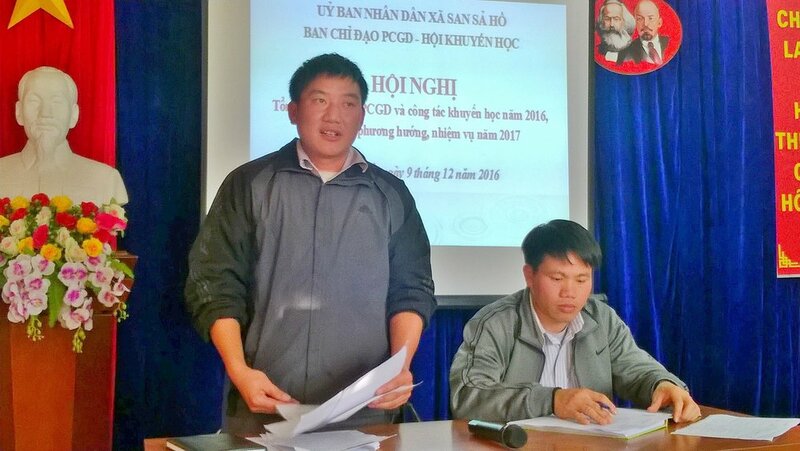 With patience and persistence toward Hieu, I started to see the small changes in Hieu. Instead of crying out loud on the floor, he now smiles and laughs a lot. Instead of isolating himself in a corner, he is now playing with people. I have seen and learned the power of love. I believe that not only Hieu, but all the children in my class will be transformed. Since 2015, GVI have been installing water filters in schools in rural areas of Lao Cai, Vietnam. On September 15th 2017, my class opened. I started the new school year with five children (age 24 to 36 months, one with autism, one with Down syndrome). I was excited thinking about teaching children in a spacious classroom. But no. Because there were only five children, I was advised not to use the large beautiful classroom. I taught them in their own sleeping room. Every day, I came to the classroom, gathered my teaching supplies, prepared the activities for the day and then brought everything to the sleeping room and held class there. The room was small, multiple cribs surrounded the room and left only a few feet of space in the middle for me to use. After 3 weeks, the new director visited the orphanage and saw our class. She notified me that she would move these five children up to the new classroom. From that day, I could teach these children in a better environment. Our class have only 5 children; but they were underdeveloped in every aspect: language, cognition, ethics, etc. This was a challenge for me. Every day, I tried to play and communicate with the children here. The children were excited and happy when they come to class, play, and explore with me. I hoped that more children would be able to come to this classroom. A few days later, the vice director of the center came to our class. She saw the children laughing, playing, and jumping around the room. She said she’d send five more children aged 18-24 months to the class and join the afternoon activities. I was delighted because we now had five more children in the class and I had the opportunity to play with them and teach them. My class now has 10 children. Every day, they grow and learn to listen more. I love them and I really like this job. The talent show, is it just for fun? Absolutely not. 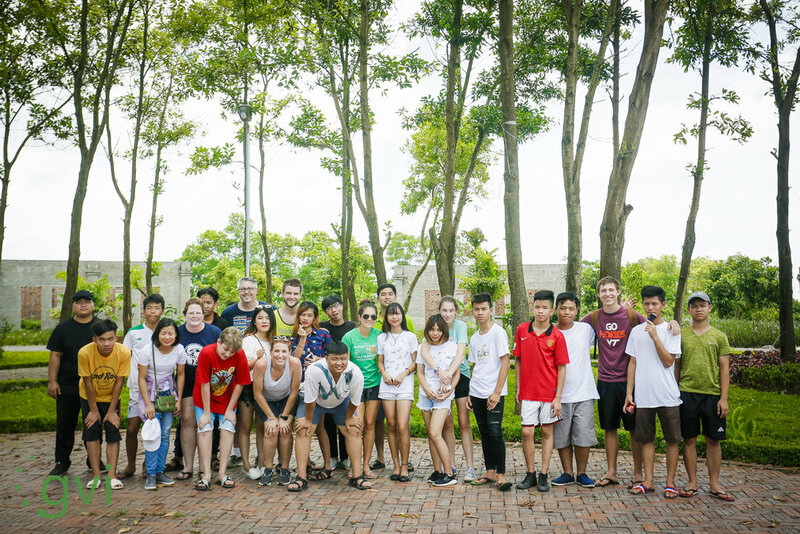 Every year, we host summer camps for children living orphanages in Hanoi. The first night of camp usually include a talent show. This is where children, staff from orphanages as well as our volunteers show their talents and skills. The entertainment value is great and that’s the impact that can be seen easily. But let’s dig deeper into the real impact that you make as a volunteer. To understand the solution, we first have to understand the problem. Orphaned children face tremendous challenges; everyone knows that for a fact. When you think of an orphaned child, what does he or she look like? Are you picturing a sad face? Old dirty clothes? Perhaps a hungry child? If you have been on our orphan trip, you are probably giggling reading this right now. Our common perception of orphans deceives us into thinking orphans are less than normal. That same perception puts us onto an imaginary throne to reach down and lift these orphans up. But is that really the case? What we have learned through the years working orphans is that their challenges are often relational. One of the most common problem is a lack of self-esteem. If there is one thing all orphans has in common, it is that they had a broken family. A child is a seed full of potentials and possibilities; a family supports and foster that seed to grow and become a tree. But when there is no one to affirm these boys and girls of their great abilities and potentials, they grow up thinking they are not capable. The results are orphans who have the technical trade skills but struggle to find a job, orphans who never used their talents, and orphans denying themselves of their success. On the other side of the spectrum, we have seen orphans growing up trying to impress their friends to prove themselves. Both ends of this spectrum are problematic and we never want to see our children in either one of them. Have you ever felt like you are not good enough? Have you ever tried to impress your friends because of your insecurities? Are you the orphaned? By now, you can see that these boys and girls are struggling with the same deep issue that we struggle with. The same power that created you, Steve Jobs, Albert Einstein and Shakespeare, created them too. These young guys and gals hold as much potentials as you do. Congratulations! By seeing orphans in an understanding and loving way, you already stepped off that imaginary throne. Now let’s get back to the talent show. Through this talent show, we give our children an audience who values and appreciates them for who they are, because they are beautiful and talented individuals. We do not have judges for our talent shows, because we celebrates their uniqueness, not condemn their differences. We share our own imperfect, clumsy, not so awe-inspiring talents with them, because we are just as broken as they are, just in different ways. The impact does not stop there. Leading up to the summer camps, our children spent months practicing and preparing for their performance. We also provide classes to teach them arts such as music, drawing, and dance. Through these classes, we were to teach them critical values such as perseverance, social responsibilities, and self-discipline. These are the values and skills that will help them for the rest of their lives. If you are wondering why we are wishing you Happy New Year in February, it’s the Lunar New Year in Vietnam. In Vietnamese, we call it Tet. This is the season for family to gather and celebrate. Along with traditional food, each family will have a peach tree in their house. The houses are decorated with festive red and yellow décor. One of the cultural traditions is to write on the first day of the New Year. Therefore, we are writing to you, our glocal family today. This past year was a wonderful year for our team in Vietnam, the four domains we focused on (Education, Medical, Economics and Family) saw tremendous transformation. The relationships with our local partners have flourished as well, allowing us to engage deeper with each domain and community. Looking back at 2016, we are most grateful for you, our family and friend. Because of your talents, we were able to build, to heal, to teach, to serve. Because of your support, we could transform thousands of lives. Because in everything you have done, you have done in love, thousands of hearts were transformed. We put together a video to show you’re the impact you made here. While the facts are impressive the real impact you left was even more powerful. Thank you for your time, talents, and resources. We truly appreciate you. This New Year, we wish you and your family a wonderful year. Let’s walk boldly into the year of the Rooster as one family, a glocal family. My name is Shaylie Maskell, I am 19 years old, born and raised in Canberra, and just entering my second year at university, studying Secondary Teaching, History and French. I have been teaching dance for the last few years and love to perform, whether dancing, singing or acting. In my spare time I love to read, write, go for long walks and hang out with my friends. 2. What did you do during your internship with GVI? I assisted Hue with teaching English to the Rainbow Kinder and My Dinh Nursery children. I also taught a dance class to the older children at SS3 and hosted and English Club once a week. I also enjoyed a lot of flexible free time which I used to explore the area I was living in, prepare for lessons, talk to my family and friends, and walk around the more touristy areas. 3. What were your reasons for coming back to Vietnam? God has inspired me with a love for Vietnam. I love the culture and the people, and they always make me feel so welcome every time I come there. I love to be able to help people, and to work with kids, so assisting at SS3 has been an awesome experience for me! Plus all the Vietnamese food is delicious! 4. What was your favorite memory/experience? I think one of my favourite memories was when I came into SS3 on a Saturday and all of the Rainbow Kinder children cried out “Chi Shaylie!” and ran up to me, hugging me, fighting for who got to hold my hand and dragging me around the courtyard. It was just so wonderful to see their smiling faces as they showed me around their home, I felt honoured that they enjoyed my company and wanted to welcome me into SS3. I also have fun memories of the English Club lesson where I showed the students Australian slang to see if they could work out what it meant, and discovering how ridiculous Australian English was! 5. What impact did you hope to make in the community you served? I really just hoped that God could use the Holy Spirit to shine through me and show his love to the people I worked with. I hoped to be able to share experiences with the community around me, to be able to help them grow their enthusiasm for English and to show them that there are people who care for them from all over the world. 6. How did the community/children impact you on this trip? In a big way! Apart from learning more about the culture, cuisine and language, the people inspired me to take a look at my own life and culture and improve it. I was inspired by the welcoming, friendly, kind people who opened their homes to me, and whose love for God and each other was strong. The kids’ resilience and friendship despite their unfortunate situation really made me feel especially conscious of what I can do with my privileged background to help the people around me. 7. How did going to Vietnam shaped you as a person? Going to Vietnam helped me to really understand what life is like for the Vietnamese people and how their communities are so tightly knit by their experiences, but are still always so welcoming. I have come to realise the power of community, and the need for God’s love to be the thing that comes first and foremost in all lives. I carry this with me as I go about my life in Australia, and hope that I can use it to inspire others around me. 8. Why do you think people should volunteer and serve in Vietnam? I think that people should volunteer to serve in Vietnam because they will have a big impact on the people there. 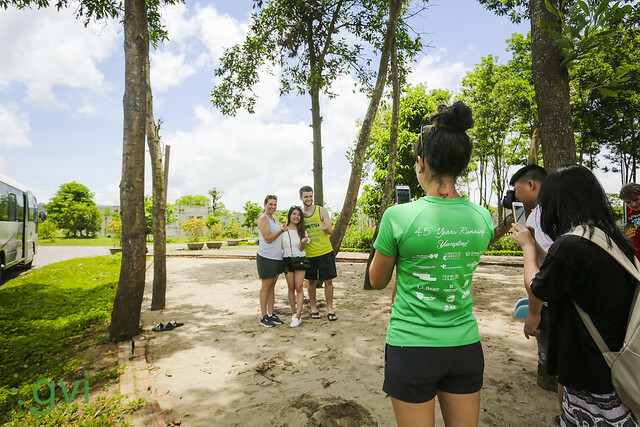 No matter how much you underestimate what your service would have, the snowball affect that can come from one person’s visit, from one person sharing their time and love with the Vietnamese people, can have a great reach than anyone could imagine. If you want to change the world, you can do it one person at a time! 9. In three words, please summarize your experience as a GVI Intern in Vietnam.